Whether you’re looking for a long-term partner, or already have one, it pays to have the right habits in a relationship. The thing about guys is that they don’t always know how to articulate what they want in their woman. Most men weren’t exactly taught how to express their feelings while growing up. So it can be tricky sometimes for them to let their partner know about their emotional and physical needs. And this leads to all sorts of misunderstandings and unfulfilled expectations, which can put a wedge between you two. Ok, this might sound like familiar territory, but listen up. Typically, a lot of women (and men!) try to make someone like them by putting on a detached-but-I-might-be-attracted-to-you kind of act. Also, these women may wait for an arbitrary amount of time to reply to messages (e.g., a couple of hours, a few days, etc.) to avoid looking desperate. Worse, they’ll pretend they’re busy, hoping it’ll make a guy more interested in them. But this approach tends to backfire. It’s confusing - and worse, he’ll eventually see through this stilted act. This, of course, is a huge turn-off. There’s no problem showing interest in a guy. And there’s no need in this day and age to play silly mind games. Instead, you can play a different kind of game – one built on authenticity. Give your guy hints that you like him, and be enthusiastic when you’re together. Experts find that a person starts falling in love with someone once they knew they wanted them. As for the “playing hard to get” part, that means actually being busy. That’s not the empty kind of busy where you’re at home, scrolling down endlessly on your social media feed. It’s better to be fully engaged with all the other parts of your life. You’ve got your work, social life, hobbies and other passions that make you well-rounded and happy. If that makes you unavailable from time to time, that’s a good thing. Richard Wiseman, author of “59 Seconds: Change Your Life in Under a Minute”, did some research on this. He found that people who were hard to get gave the impression that they’re a scarce resource. However, they ALSO had to be enthusiastic about the other person to be attractive. That way, it put the subject in a more balanced and attractive light. In a nutshell, you need to generate strong emotions within your guy while he’s with you. He’ll then associate those feelings with you, which naturally creates that spark. In an MIT study, behavioral researchers found that people have a habit of transferring their feelings from one setting to the next. For instance, if you nearly hit another car while driving to work, you’d carry those negative vibes into the office. That previous, unrelated experience would bleed into the rest of your day. Some call this “emotional misattribution” or “emotional leakage” - this is the human tendency to attach strong feelings to the nearest person, even if they had little to do with it. Also, it has to do with the fact that being physically aroused can easily translate into a sexual attraction. So, if you can find a way to keep things exciting for him – like doing sports or something physically intensive – then he’ll latch those feelings onto you. Admittedly, a lot of women reacted to this piece of advice with a raised eyebrow. But hear me out – this could be a game-changer in your relationship. First of all, you don’t need to be rolling on the floor with tears in your eyes if his jokes bombed. A polite chuckle is perfectly fine, and that gives him the hint that he’s not funny (i.e. you’re not attracted to him). But if your funny bone really is tingling from his witty one-liners, then go ahead and laugh. Studies show that humor is a huge factor in sexual attraction. As you already know, women like guys who are funny because it’s a sign of intelligence (which is an attractive trait). …and more to do with a man’s desired to be appreciated by his partner. Trust me, I know plenty of guys who have appreciation as one of their “must haves” in a relationship. So, appreciating his sense of humor is a good step in that direction. According to several studies, you can be more attractive by hanging out with your friends. This basically states that someone’s perception of you changes favorable once you’re in a group. On the surface, you might think it’s because you’ll appear more sociable and friendly. This makes you attractive without looking like you’re trying too hard. But there’s another angle to it. You see, the human brain has a habit of categorizing individual elements (like shapes, objects and people) into a general group. This is mostly a hardwired survival trait to not visually focus too hard on one thing - but rather the whole picture. And this instinct spills over into a person’s social life as well. So in a practical sense, you can set your social media (and online dating) profile picture to a photo featuring you with a group of friends. Just make sure it’s clear who you are in the picture so you don’t get lost in the sea of faces! If you’re looking to a meet a guy in a bar or a party, make sure to bring your squad along too. Social proofing is a real phenomenon, so use it to your advantage. There’s really no surprise here. Any guy who’s interested in women will obviously want physical intimacy in the relationship. But you’d be surprised – and even downright concerned – how many women are lacking this department. A lot of them take for granted the power of using their feminine charm to win a guy over. And no, I’m not telling you to start acting out a scene from an adult film to turn a guy on. What I am saying is that you should be more aware of a guy’s hot buttons, and learn how to push them. For instance, women underestimate the power of physical touch. Most men go their whole lives not knowing the pure pleasure of a validating pat on the back, a hug, or other forms of affection. Women, on the other hand, tend to experience this on a daily basis. …or putting your hand on his arm for a few precious seconds. And of course, men also appreciate variety when it comes to the main event in bed. Make an effort and take the initiative to spice things up every now and then. Better yet, you could even go as far as asking him what he wants, then apply it in bed after (with your consent, of course). That would make for an interesting topic, don't you think? One more thing - there’s another trait I didn’t mention earlier, but it’s incredibly attractive to men as well. 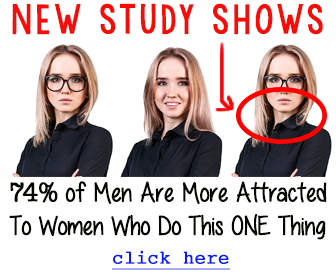 …your guy will instantly enter a state of intense infatuation. It’s like a splinter in his mind, and he’ll be incapable of thinking of any other women in a romantic way – except YOU.